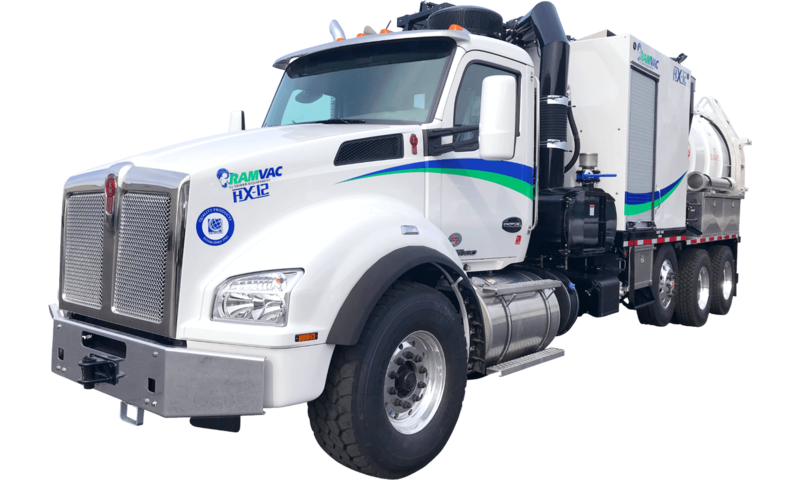 The RAMVAC HX-15 is the BIG DADDY of the RAMVAC family, however, you do not have to compromise for that size either. We STILL feature a footprint some 36” shorter and a payload capacity some 2500# greater than our competitors. This tridem axle configuration unit offers a 15 cubic yard debris body, a boom reach of 21 to 26 feet with a 320 degree working radius. The 8″ vacuum system for these units feature a 4400CFM and 18″ blower capacity, as well as cyclone separation, a vacuum enhancer, directional discharge, hydrostatic blower drives, and a 10 micron final filter. For the water system, the HX-15 features a 1,300 gallon water capacity, a 10GPM @ 2500PSI pump, 400,000BTU water heater, all in a 80,000BTU heated enclosure. The HX-15 also boasts compact footprints, NEMA rated electrical systems, debris blow-off systems and fully hydraulic power trains for superior reliability. For customers looking to dig with air, you have the option to add a 185CFM @ 150PSI air compressor to your unit. All these features combined with a parts and service network that is available 24/7 makes it clear why RAMVAC is the best value for your equipment needs today! 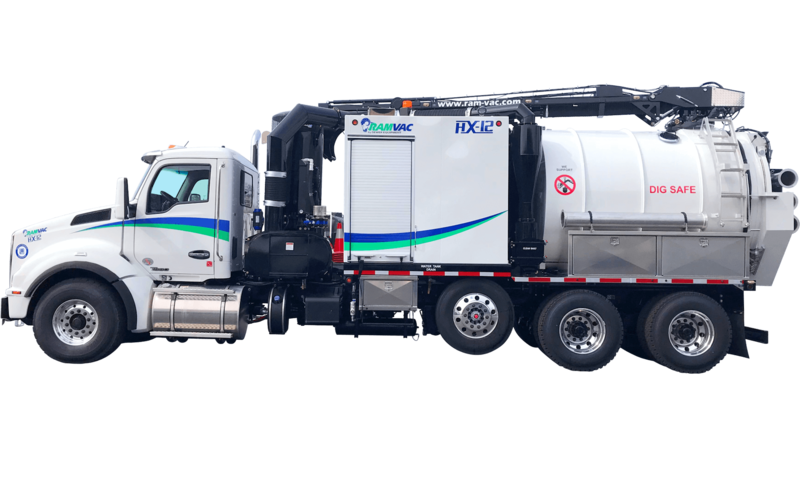 To see the RAMVAC in action, click here. The mainstay of the RAMVAC family! We feature a footprint some 36” shorter and a payload capacity some 2500# greater than our competitors. This tandem axle configuration unit offers a 12 cubic yard debris body, a boom reach of 18 to 23 feet with a 320 degree working radius. 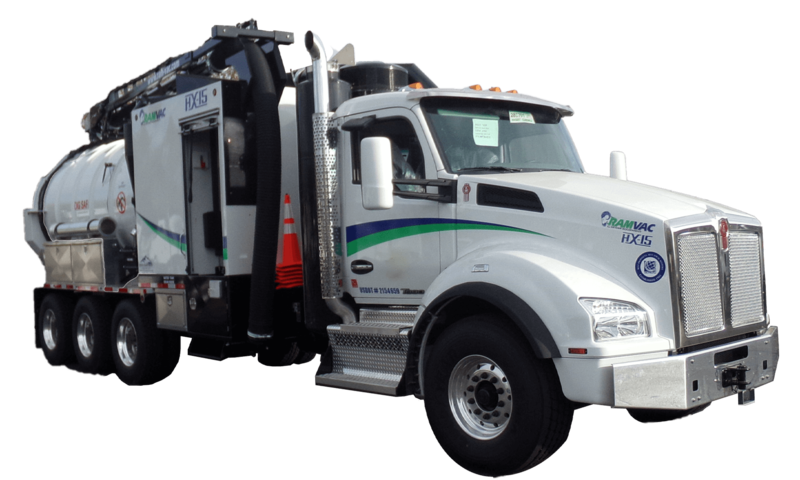 The 8″ vacuum system for these units feature a 4400CFM and 18″ blower capacity, as well as cyclone separation, a vacuum enhancer, directional discharge, hydrostatic blower drives, and a 10 micron final filter. 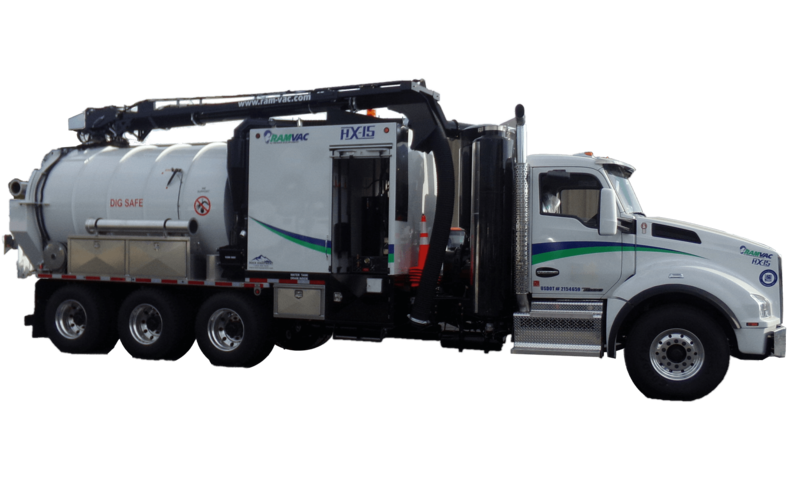 For the water system, the HX-12 features a 1,300 gallon water capacity, a 10GPM @ 2500PSI pump, 400,000BTU water heater, all in a 80,000BTU heated enclosure. The HX-12 also boasts compact footprints, NEMA rated electrical systems, debris blow-off systems and fully hydraulic power trains for superior reliability. For customers looking to dig with air, you have the option to add a 185CFM @ 150PSI air compressor to your unit. All these features combined with a parts and service network that is available 24/7 makes it clear why RAMVAC is the best value for your equipment needs today! 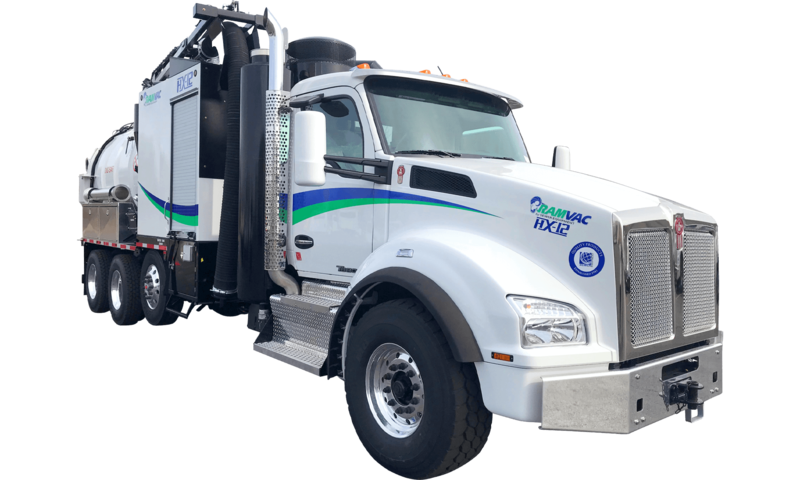 To see the RAMVAC in action, click here. 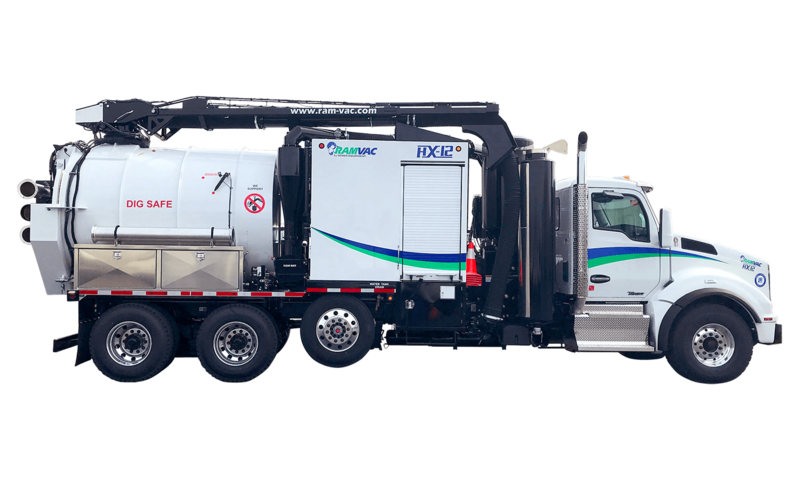 The smallest unit in the RAMVAC family of full size hydro excavators, these unit are equipped with large productivity features. This tandem axle configuration unit offers a 12 cubic yard debris body, a boom reach of 15 to 20 feet with a 320 degree working radius. The 8″ vacuum system for these units feature a 4400CFM and 18″ blower capacity, as well as cyclone separation, a vacuum enhancer, directional discharge, hydrostatic blower drives, and a 10 micron final filter. 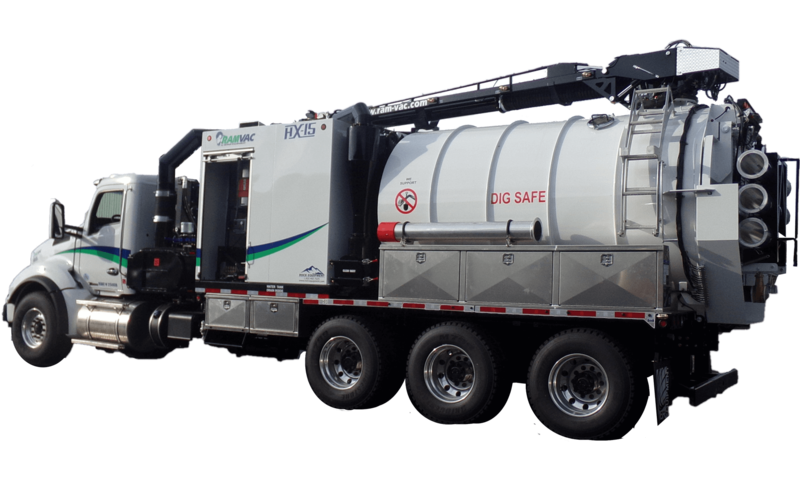 For the water system, the HX-9 features a 1,300 gallon water capacity, a 10GPM @ 2500PSI pump, 400,000BTU water heater, all in a 80,000BTU heated enclosure. The HX-9 also boasts compact footprints, NEMA rated electrical systems, debris blow-off systems and fully hydraulic power trains for superior reliability. For customers looking to dig with air, you have the option to add a 185CFM @ 150PSI air compressor to your unit. All these features combined with a parts and service network that is available 24/7 makes it clear why RAMVAC is the best value for your equipment needs today! To see the RAMVAC in action, click here.